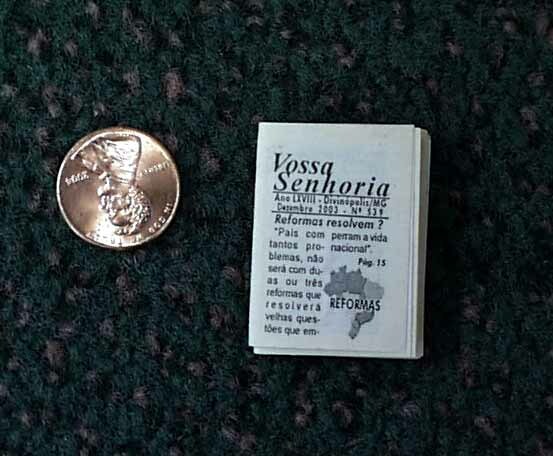 VOSSA SENHORIA, Divinopolis, Brazil, 2003 A fascinating curiosity as this is the smallest newspaper in the world (as recognized by Guinness Book of Records). This monthly newspaper started in 1935 as a solution for creating a quality low-cost newspaper. Mostly in Portuguese, and containing 24 pages. Each issue is different so the issue you receive may differ from what is seen in the photo, but the format is the same. About the size of a postage stamp, it measures about 1 by 1 1/2 inches! Nice to have the world's smallest newspaper.